To make one block you will need a Fat Quarter, a Fat Eighth, and a Fat Sixth (My new term :) You will use the remaining scrap from the fat Eight for another blocks fat sixth and vice versa. From your Fat Sixth sub-cut (3) 5 1/4" squares. From the Fat Eighth sub-cut (4) 2 1/2" x 2 1/2" squares, (10) 3" x 3" squares, and (1) 5 1/4" x 5 1/4" square. From the Fat Quarter sub-cut (4) 2 1/2" x 4 1/2" rectangles, (16) 2 7/8" x 2 7/8" squares, and (10) 3" x 3" squares. Now we are ready to start making some geese. This is a great method of making Flying Geese that have no waste. And you won't be sewing any triangles along the bias which helps to keep everything nice and straight. To save time be sure and repeat each of the sub-steps 4 times making your geese in an assembly line fashion rather than making 1 set of geese at a time. 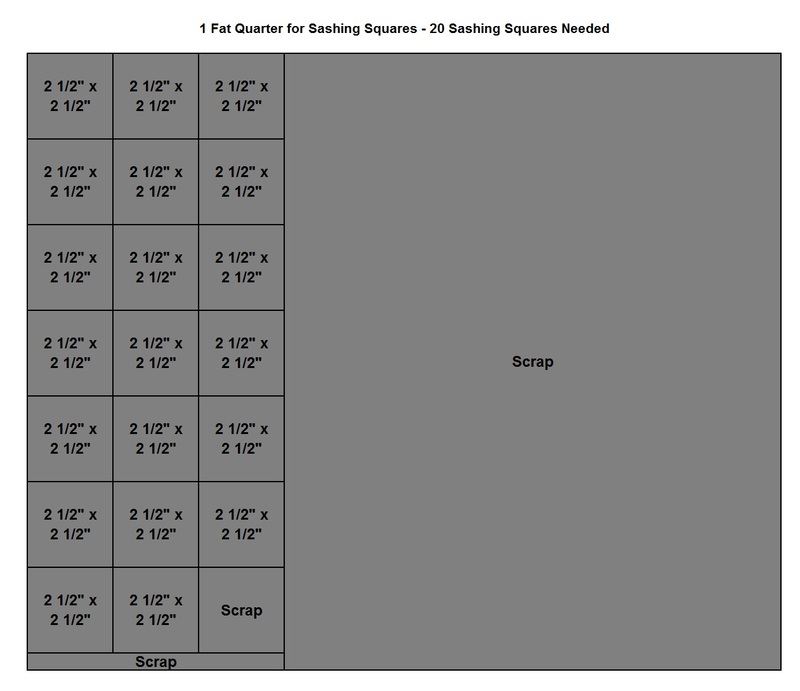 So grab your (4) 5 1/4" squares and your (16) 2 7/8" squares and let's get sewing. Now go ahead and pin both sides of each square adjacent to that drawn line. Make sure to put them out far enough that your presser foot won't hit them as you sew on by :) Now stitch a 1/4" seam along both sides of the drawn line (the black lines represent your stitching lines :) Remember, you are doing these assembly line so go ahead and chain stitch all 4 sets on the right hand side of the line, and then go back and do all 4 sets on the left hand side. And you are done!!! You should have a whole flock of geese (16) that are precisely perfect and ready to get flying!! Now onto the Half Square Triangles. These are my favorite :) To save time be sure and repeat each of the sub-steps 10 times making your HST's in an assembly line fashion. 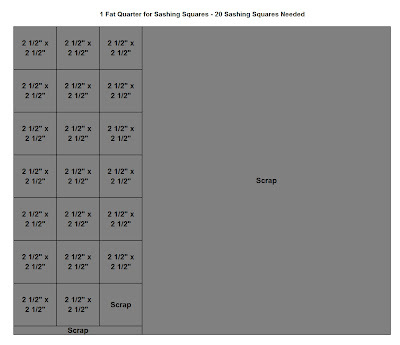 So grab your 2 sets of 3"squares and let's get sewing. Lay your dark square on your light square with rights sides together. Pin both sides of each square adjacent to that drawn line. Make sure to put them out far enough that your presser foot won't hit them as you sew on by :) Now stitch a 1/4" seam along both sides of the drawn line (the black lines represent your stitching lines :) Remember, you are doing these assembly line so go ahead and chain stitch all 10 sets on the right hand side of the line, and then go back and do all 10 sets on the left hand side. And now you are ready to trim up your HST to 2 1/2". Align the 45 degree line on your ruler with the seam line on your square. Make sure that the raw edges of the square under the ruler are over the 2 1/2" line's on your ruler. Trim the 2 sides. Now spin your block 180 degrees. Once again, align the 45 degree line on your ruler with the seam line on your square. Align the raw edges of the square under the ruler on the 2 1/2" lines on your ruler. Trim the 2 sides. And now you have Perfect Half Square Triangles. You should have 20 total. Now, lay our your 4 rows as follows. You are going to sew the top 2 rows together and the bottom 2 rows together. Lay the first of each set onto the second with right sides together. Take care to pin each of your seams so they match up nice and tight :) Sew a 1/4" seam along the pinned edge. Press your top and bottom row and set them aside for a minute. Now grab your alternate color flying geese and your rectangles and lay them out as follows. Lay your Goose block onto your rectangle with right sides together. Pin and sew a 1/4" seam along the pinned edge. Oh, and if you make sure to cross your stitches directly on top of the little x made by your previous seams you will get perfect points every time :) Clip your threads and press your seams open. Now just sew the 5 rows together. Same again, Lay the first row onto the second taking care to pin the seams and sew a 1/4" along the pinned edge. Sew Row 1 and Row 2 together and then sew Row 3 and Row 4 together. Then add those rows to either side of center block. Now grab your top and bottom rows that you set aside. You know what to do now. Just lay the top row onto the center row with right sides together, pin the seams, stitch 1/4" and press open. Then repeat for the bottom row. Now, it's time to grab those remaining 7 Fat quarters to cut up. Sadly, I forgot to take pictures of my cutting so you will just get digital images. (Sorry). 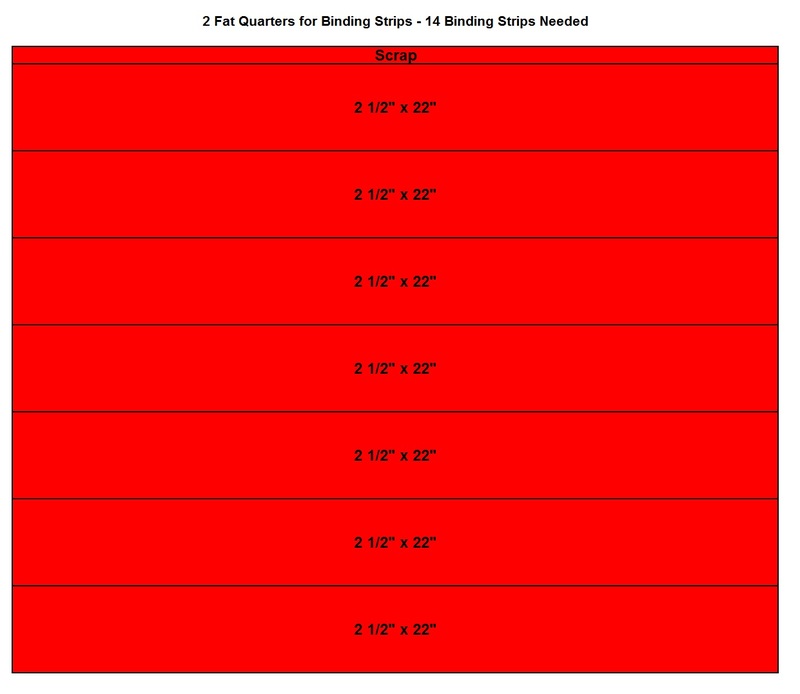 From 2 Fat Quarters (I used 2 red ones) cut (14) 2 1/2" x 22ish" (trim selvage) strips. 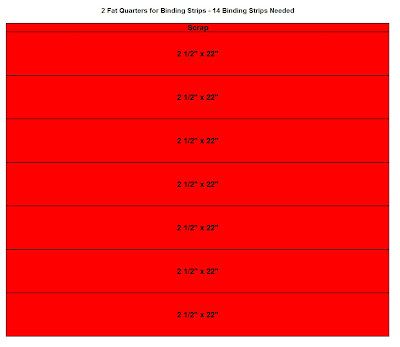 You will be able to get 7 strips from each Fat Quarter. Set these strips aside. They will be used to create a binding strip for your finished quilt. Now everything is all cut out and you are ready to lay the quilt top out. 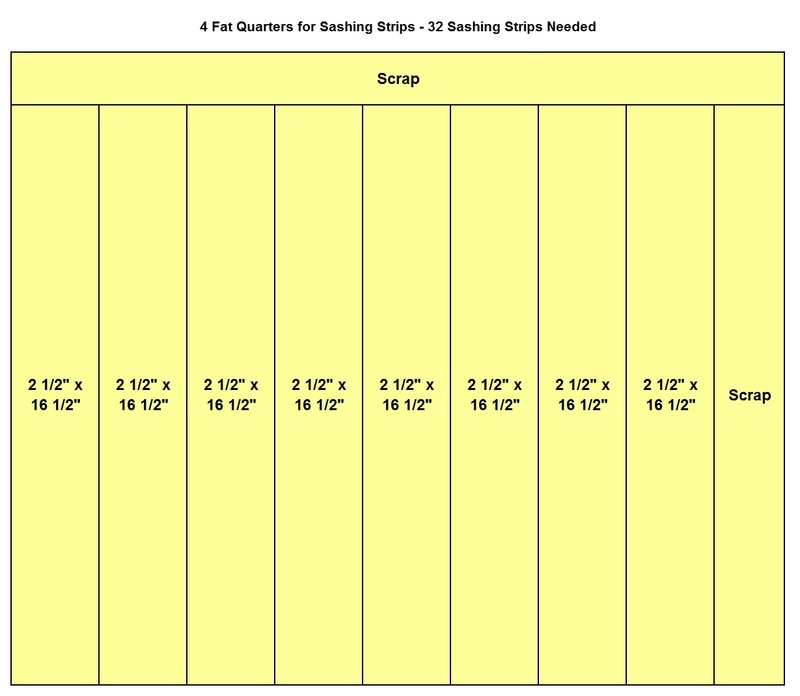 Using a design wall or the floor, lay your sashing squares, your sashing strips as follows. Play with the placement of the blocks and sashing until you get a look that is pleasing to the eye. Now, it's time to start sewing. Begin by sewing the sashing rows together. Just sew each piece end to end using a 1/4" seam until you have sewn the entire row together. Press towards the sashing strips. Now you are ready to sew your rows together. The is the same process as creating the rows, just on a longer scale. Place the sashing strips along the bottom (and top for first row) of your rows with right sides together. It is very important to pin each of your seams aligning the seams of the square sashing with the sashing. Sew a 1//4" seam along your pinned edge. Press towards the sashing. Now lay Row 1 onto Row 2 and Row 3 onto Row 4 with right sides together. Again, make sure to pin all of your seams. 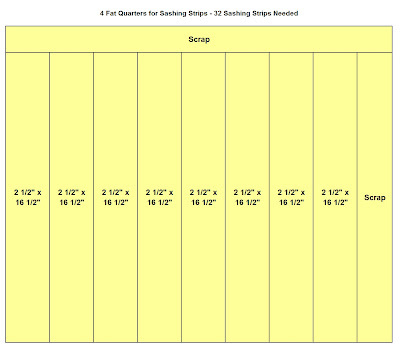 If you need to ease in a little in the blocks do that but make sure your sashing seams line up. sew a 1/4" seam along the pinned edge. Press towards the sashing. Finally, Lay your now Row 1 and 2 onto Row 3 and 4 with right sides together. Pin your seams, and sew a 1/4" seam along the pinned edge and then press towards the sashing. Now you can enjoy your wonderful Spinning or Spiraling Quilt!!! Measuring at 56" x 84" it is perfect for snuggling up with infront of a cozy fire!! So what have you been trying new this week?? The block is beautiful, but I have to be honest, when I saw it yesterday that you picked it for a bee block, I nearly fainted! But then I saw you were mailing out the fabric and I realized it didn't pertain to me;) The tutorial is great and maybe one day I'll get up the courage to attempt so many flying geese in one block! great block! what are you going to do with it? The block looks wonderful and I LOVE that fabric line! Great tutorial. Fantastic block tutorial.Are you doing a big size quilt? Great block and thanks for the party! This is amazing! I love a tutorial and pictures of how to cut the fabric - thanks!!!! Thanks! I will have to try those flying geese. Cute block! I'm so glad you wrote out the tute for this one! I love it! It looks complex yet totally doable. Thanks for taking the time and I totally dig the term fat sixth! I love this...I've been struggling with what to do with a Christmas line that I have. I hope I have enough to do a few blocks for a lap quilt! I love that block. Thanks for the great tutorial. Maybe that will be my TNT for next week! Love, Love, Love this block!!!! Thank you so much for this wonderful tutorial. I just love this block and have saved it for future reference. Great block. Will make a fabulous quilt. Melissa, what a fun block! The tutorial was very well done. Now I've got to rush to my stash and pick some cute fabrics to use on it. Have a great weekend... and dream up some more blocks! Thank you so much Melissa. I have made a pdf of this and will make it some day soon. That is such a gorgeous quilt and great tutorial! I hope I can make it one of these days. And just right for the season, although I agree with you that it'd look great in many color combos! Thanks! I just started following you!